Australians may find it easier to travel, live and work in the UK following free trade negotiations that could put visas on the table, Foreign Minister Julie Bishop said in London. Speaking at the conclusion of the AUKMIN talks, Ms Bishop said the ability to work, travel and study in the UK and vice versa is an essential part of such a close relationship. More than 160,000 people have signed a petition calling for freedom of movement between the UK, Australia, Canada and New Zealand with an organisation dedicated to the cause. But despite the close historical ties, the number of Australians living and working in the UK has fallen by 40 per cent since 2008 under restrictions aimed at capping net migration. 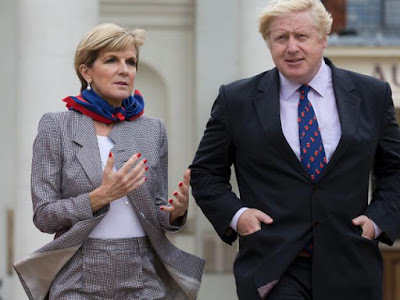 UK Foreign Secretary Boris Johnson has previously been a champion of Australians in the UK and described such restrictions as “peculiar”. Now installed as Foreign Secretary following the Brexit vote, Mr Johnson said “of course” he would continue to campaign for a relaxation of rules while the UK works out its exit from the EU. The flaxen-haired foreign secretary praised the “almost glutinous harmony” between the two countries during talks this week covering trade, immigration, defence and foreign affairs. “At the risk of pomposity, our two countries, I think, do represent values, freedom, democracy, an attachment to civil society, a belief in equalities that are not necessarily universally accepted and perhaps are more contested in parts of the world than they were even 20 years ago,” he said. 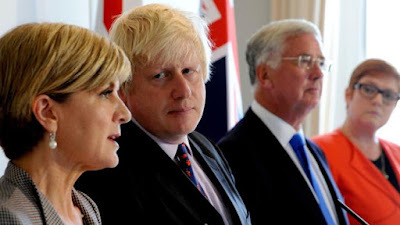 Defence Ministers Michael Fallon and Marise Payne also outlined their joint commitment to co-operation in military theatres around the world and a strengthening of the “Five Eyes” intelligence sharing arrangement between Australia, New Zealand, the US, UK and Canada.